The Monroe snow removal squad is doing well this year. Lenny, Dave and Troy with Brad as their backup are the ones behind wheel. The plow truck was modified this year to have the sander rig in the truck. This has been a nice enhancement. They can spread sand at slippery intersections when needed. And the weight of the apparatus helps to give the plow truck more pushing power too. That left the blue pickup available to have a dual sided fuel tank installed. This has been very helpful in the refueling procedure for the plow truck and the tractor. The tractor has a snow blower attached to it which gives it the ability to clear those drifts that are too much for the plow to push through. 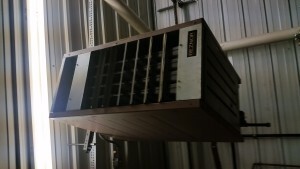 This ceiling mounted furnace heats the garage portion of the community hall. It stopped working 3 weeks ago and we split a water pipe. We had a service call with Luke and the pipe was fixed and the heater got a new thermo couple. Then it was noticed again that the heater was not working; luckily no pipes froze this time. Luke cane again today and this time replaced the gas valve. The heater was working when I got home today. Our hall actually has 2 furnaces in it. 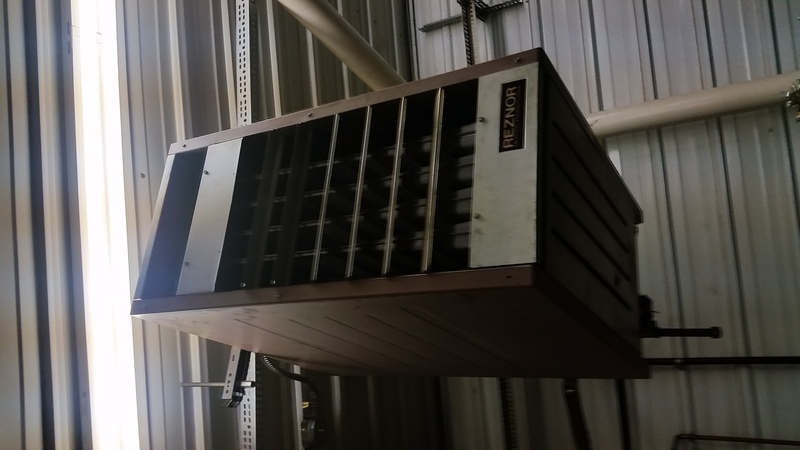 One for the main room and this hanging furnace in the garage. This is the antique fire fighting apparatus that is now sitting in the new garage. 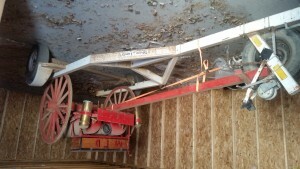 The trailer that it is sitting on has been customized and donated by Benton Visser. We have mad a few changes with our equipment for this year. We took the sander (was in back of blue pickup) and mounted it into the back of the plow truck. In order to do this the truck was taken to Marion Machine Shop earlier this fall and an extra support brace was installed. Then Troy and I moved the control box from the blue pickup to the plow truck. The next change had to do with a dual sided fuel tank (diesel and gas) that Mark Begemen had donated to the city earlier this year. We placed that in the back of the blue pickup where the sander rig use to be. The reason we made these changes was because of a few difficulties that we experienced last year. First the blue pickup does not seem to be able to take a large load of sand. We experienced the drivers door not opening due to this. Don Bauer readjusted the door this summer so it could open again. The next problem was refueling the tractor. The diesel fuel was stored in a tank on Ron Overson’s property. We had to run a couple of 100ft extension cords through the snow to his building in order to get the fuel out of the tank. It was a dark cold and annoying method of refueling. Refueling the plow truck was a little bit of work too. The chains must be removed from the tires so the truck could be driven to Marion. Then afterwards the chains had to be put back on the rear tires. So now we have a refueling tank sitting in the blue truck and we plan on driving that truck into Marion to fill the tanks. And we can refuel both the plow truck and the tractor easily. And the plow truck driver can start up the sander using the control box inside the cab and flip a switch at slippery intersections to spread sand on the road. Also the heavy weight of the sander rig helps the plow truck with traction. We had our first snow yesterday for the 2017-2018 season. Troy Melloon cleaned up the streets last night using the newly upgraded plow truck. I drove around this morning and was very impressed with his work. The streets look very nice. Thanks Troy! 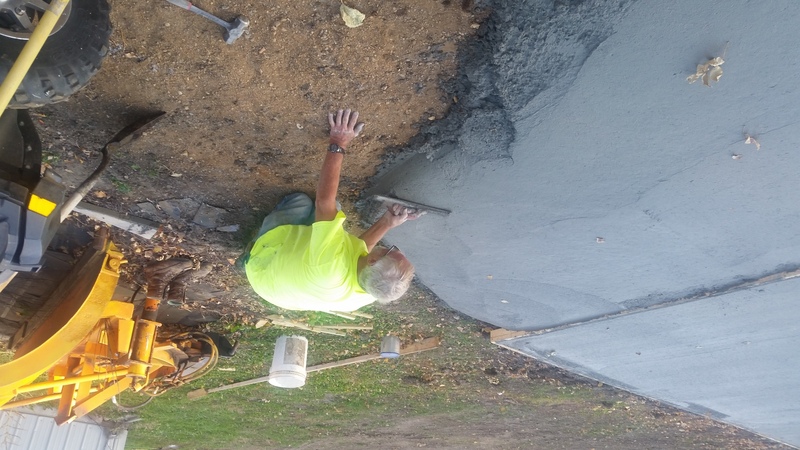 Kurt Masterminded the concrete work for the Monroe Fire Dept’s new garage. He is seen here working the extra concrete that was dumped in front of the slab. 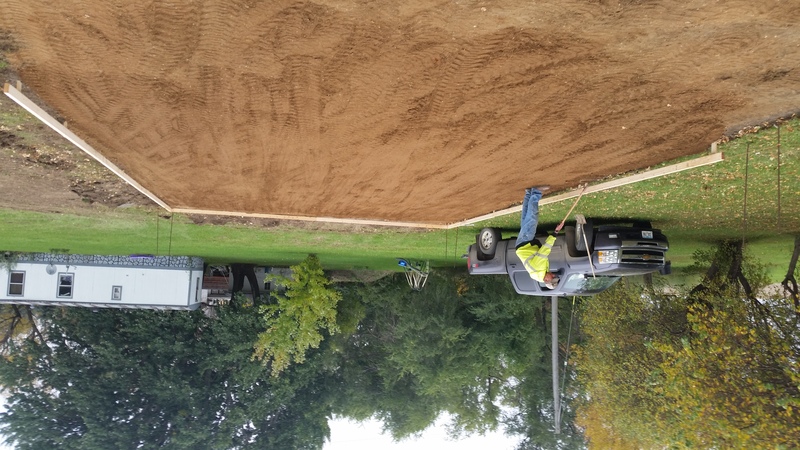 There will be gravel poured on later to form a ramp for the garage. Troy Melloon is seen here preparing the ground for the slab to be poured. 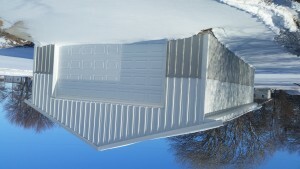 We are rewriting the building permit ordinances. The problem is that we currently have two sets of ordinances; municipal and zoning. Both are legal valid documents. But they counter dict one another. Another problem (in my opinion) is that they are too strict. People don’t want to update their properties because they are afraid of getting their yearly property taxes increased. So I want to rewrite the documents such that they describe one procedure to follow. And I want to make the requirement to need a permit to be more lenient. So people can make repairs on their property and update the condition of their property without getting reassessed. I stepped outside tonight and something looked different. 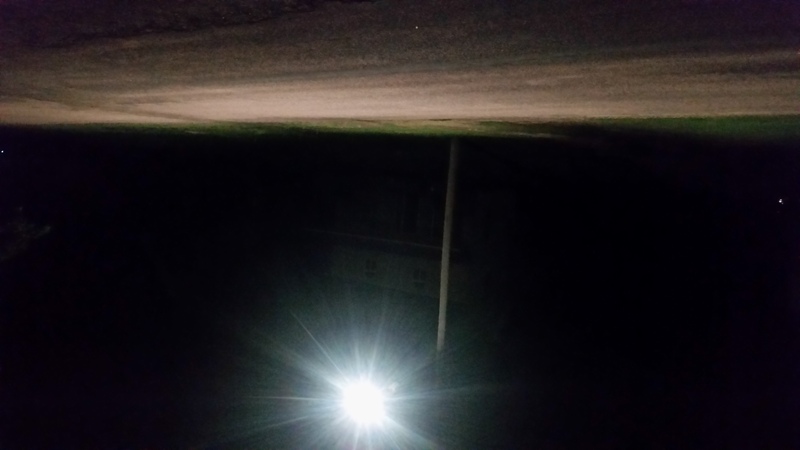 I noticed that the road seemed to be lit up a little brighter. And the streetlight was blinding to look at. Yes we got new LED streetlights and they look awesome! Thanks Xcel Energy.